This sandbox was used to create Skyrim:Lycanthropy. In the Dawnguard plug-in, a skill tree is added for werewolves, with perks that will increase your damage, health, and stamina as a werewolf, and even enhance your howl abilities. In order to unlock new perks, you must feed on corpses of non-undead NPCs. While you are in werewolf form, you cannot use any of your equipment, spells, dragon shouts, or powers, but your attacks increase in power and speed, and you may execute one of four "kill cam" moves. Pressing a single attack button may have you leaping on your enemy and savagely slashing their chests, or biting their throats. Pressing both attack buttons simultaneously may have you throwing your enemy a great distance, or lifting them off their feet and decapitating them. Your move speed will increase as well, and you will not be staggered by attacks or by attacking an enemy with a raised shield. Since you cannot use spells or items, the only way to heal yourself is to feed on corpses. Racial abilities do not carry over into your werewolf form, but existing spell effects do. This includes passive abilities such as The Lord Stone, the Blessing of Mara, and the Magic Resistance perks from the Alteration skill tree. It also includes the Destruction Cloak spells and the Alteration Flesh spells. 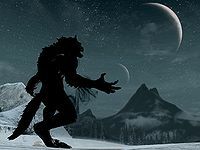 As a werewolf in Skyrim, you will be hated and feared by almost any NPC that sees you in your werewolf form, and most will attack you on sight (exceptions include other werewolves, M'aiq the Liar, members of the Dark Brotherhood, The Circle, followers, housecarls, and members of the Thieves Guild, but not your spouse, unless your spouse is one of these). Your wolf cousins will not attack you, and may even come to your aid if you use your Howl of Terror ability. 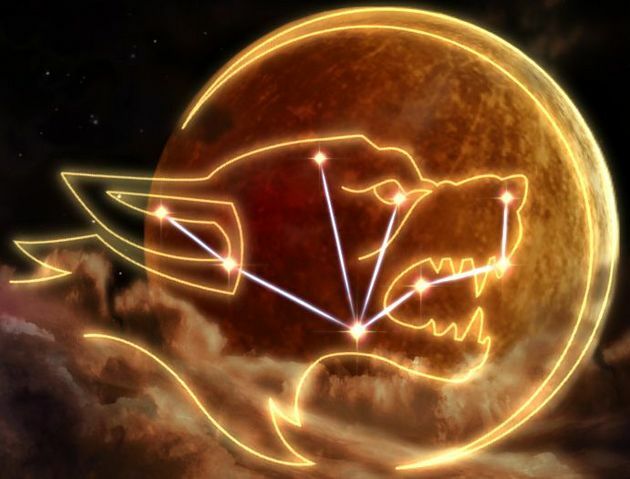 Crimes committed in werewolf form will not be attributed to you and will not increase your bounty, unless someone sees you transform; additionally, if you are seen turning into a werewolf, 1000 gold will be added to your bounty (unless the person is one of those that won't attack you). You will have a forced third-person view while Beast Form is active and will not be able to access character menus or maps. If Dawnguard is installed, opening the character menu will open the Werewolf skill tree. You will not be able to pick up any items or initiate conversation while in beast form, but you can activate switches (such as levers and pull chains) to progress through dungeons. You can command followers by pointing your crosshair at them and holding down your activate/use control. Followers cannot be commanded to pick up items while you are in beast form, however—they will interpret any such order as simply "move there". You cannot consciously choose to deactivate Beast Form once you have transformed. The only way to return to your human form is to wait for the Beast Form to end or to use the "wait" function. The Dawnguard plug-in adds a skill tree for werewolves. The skill tree is simply called "Werewolf" and perks are earned through feeding on the corpses of fallen NPCs (or creatures after the Savage Feeding perk has been unlocked). It is not necessary to feed on fresh kills—you can also feed on bodies that are already dead. Opening the character menu while transformed will instead open this skill tree. The totem-related perks will only apply if you currently have the respective totem active. Unlike the Vampire Lord, you cannot change your shout power while transformed. Each new perk requires a few more feedings than the last. The first perk requires five feedings, the second 6, and the third 9; after that, each new perk requires two more feedings than the last (up to 25 required to progress from the 10th perk to the 11th). You will need to feed a total of 164 times to complete the entire tree. It is possible to cure lycanthropy, but there is no way to regain it after being cured in the base game. You will no longer be allowed to access the Underforge once you have been cured, and you will not be able to complete the Totems of Hircine quests if you have not completed them already. The Dawnguard plug-in allows you to restore your lycanthropy with help from Aela the Huntress. You can do this only once; if you cure it again, you cannot regain your lycanthropy from Aela. To cure yourself, you must complete the Companions quest line. After you have completed Glory of the Dead, you may cure yourself of lycanthropy at any time, although you will need another Glenmoril Witch head to do so. Accepting Lord Harkon's gift of vampirism during the Awakening quest will also cure you of lycanthropy. Using the Howl of Terror counts toward your "Times Shouted" counter in the General Stats page. NPCs may still make mention of your "wolfish grin" or the "fur growing out of your ears" even after you are cured of lycanthropy. Similarly, in the statistics section of the menu, the "days as a werewolf" statistic may continue to increase even after lycanthropy is cured. Using Soul Trap on a corpse you have already eaten as a werewolf gives you another heart from the victim. You can progress werewolf perks, but you have to wait to transform again to actually unlock them. Savage Feeding benefits from this bug as well. This only applies with the Dawnguard DLC. Occasionally, you are unable to cure yourself using the blue flame immediately after curing Kodlak in the Companions quest line. This can sometimes be fixed by doing radiant quests for the Companions until a Purity mission comes up, after which you can use the flame again. You may need to complete both Purity quests (for both Farkas and Vilkas) before you can cure yourself. Players with lycanthropy can still contract diseases from traps despite having 100% disease resistance. After a finishing move, the body sometimes disappears. ? If you are dual-wielding a spell when you transform, you will be unable to use the dual attack. ? After being cured of lycanthropy, you may not receive the message after sleeping that says "You awaken feeling (well) rested"; however, the "(well) rested" bonus will still show up in the "Active Effects" menu. ? After reverting back to human form, the forced third-person camera sometimes persists. ? Interrupting the feeding animation (such as by howling) will successfully complete the feeding immediately. ? If you transform back into human form while underwater, you can walk on the river bed. ? If you return to the Underforge as a werewolf, your next transformation may only last a few seconds (as it did the first time). ? During the quest A Daedra's Best Friend, any summoned pack members may attack Barbas after you clear out all hostile enemies. ? Sometimes two of the four executions do not work (the dual power attack executions). ? This may be fixed by performing an unarmed dual power attack before you transform. If you are holding a torch or a weapon with fire enchantment while transforming, the werewolf's tail will appear to be on fire. ? If a non-werewolf contracts Sanguinare Vampiris but has not become a vampire yet, becoming a werewolf will not cure vampirism. This will progress to the player being both vampire and werewolf at the same time. Since the werewolf feeding ability overrides that of the vampire, the player cannot feed as a vampire and there will be no way to prevent progressing to stage four vampirism. ? If you are dual wielding enchanted weapons and transform during a dual power attack, your claw attacks will have same enchanted effects as your weapons. This will not use up any of the charge of the enchanted weapon. ? 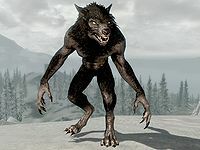 If you are wearing the Ring of Hircine when you cure yourself of lycanthropy, then it is possible to retain the power to transform into a werewolf once per day. Removing the ring after you have been cured does not disable this bug, thus allowing you to permanently have the ability to transform, even after you are cured. ? If you have received the Ring of Hircine, sometimes a werewolf transformation will be extremely long or permanent. ? While in werewolf form, it is possible to get stuck in it well over the time limit. This can be fixed by using the wait function for 24 in-game hours, though this might not always work. ?